Motion is certainly what’s new! Rich Microblogging. All of Movable Type’s legendary power for community blogging is wrapped in the simplest and easiest interface for lightweight blogging. It’s easy to post text, links, images, audio or embedded video with just a click. Action Streams. Collect and share your actions from across the web, from dozens of supported services including popular sites like Flickr, YouTube, Twitter, Delicious, and Digg. Sign in with any web account. Google Friend Connect? Facebook Connect? Why choose! Your community members can authenticate with their existing account from Google, Yahoo, Facebook, AOL, or any OpenID provider. 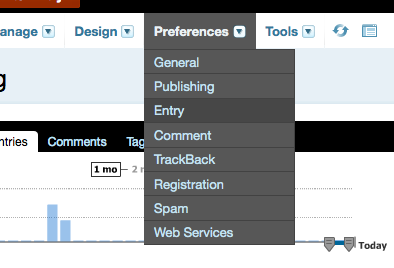 Now there are half a billion web users who can comment or vote on your content without hitting a registration barrier. Powerful Profiles. Motion profiles don’t just show your name and picture. Any registered member of your site can show their actions from across the web, seamlessly integrated with their actions on your own site. And of course they can follow other members of your community as well. Movable Type 4.2 is the culmination of the largest concerted effort by the Movable Type team and community to improve the performance of the core platform than ever before. A great number of features and enhancements are invisible to the user and affect memory utilization, and database performance. There are a number of features we have added however that give greater control to designers and administrators to assist them in optimizing the performance of their system. But performance is not just measured by how long its takes for a database query to execute. Performance is also measured by how long it takes a user to complete a task. Therefore the team has also taken the time to analyze and make improvements to Movable Type’s user interface as well. 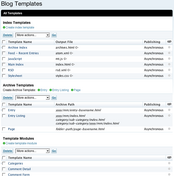 a single template listing screen - see all of your templates, archives, archive maps and template modules in one place. 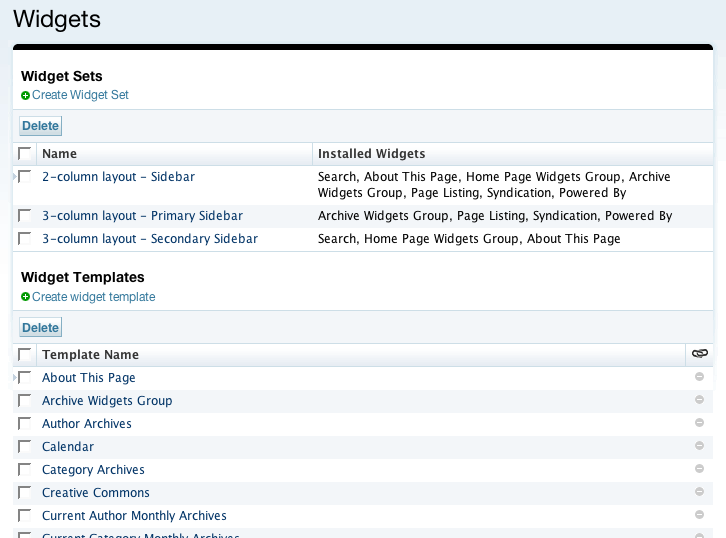 combined widget and sidebar listing screen - manage your sidebars and their widgets from one area. Arvind was kind enough to donate to MTOS one of Movable Type’s more popular plugins: Simply Threaded. With this donation Movable Type will allow commenters to reply directly to one another and for designers to display nested and threaded comment listings on their blog. One thing we have heard loud and clear is that our default templates, while powerful and flexible were too difficult for new users to wrap their heads around. So through interviews with our user community, through a series of focus groups with designers, we have completely rewritten our default templates with an eye to make it easy for people to get up and running quickly using Movable Type. Beau Smith, the lead behind the architecture of these templates has also been working on documentation to help designers make the most of Movable Type. When we approached the issue of performance we didn’t just look at the backend. We also called into question aspects of the front end that we felt didn’t make our users as efficient as they could be in completing certain tasks. To help achieve this we made a number of important changes to our navigation, including an vastly improved Preferences Menu, as well as the addition of a Tools menu. Hitting the save button on a template should never be a source of anxiety for anyone, but it can be if there is any doubt as to what your site will look like once the template has been saved. Therefore we have added the ability for you to preview changes you make to your templates before you save them. 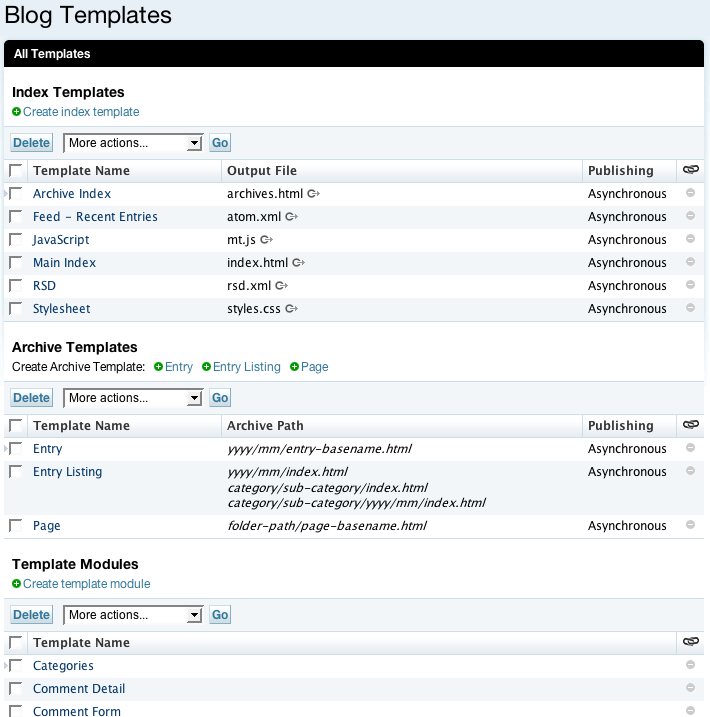 New Template Publishing Options - now every index template and archive mapping can be configured independently in regards to how that file should be published. Instruct Movable Type for example to publish monthly archives and feeds asynchronously, and everything else synchronously. Publishing Profiles - select from a number of different publishing options, like publish everything dynamically, or everything asynchronously, or even build your own. Server Side Includes (“SSI”) allow for content of a page to be generated and saved to the file system and then for that content to be included at the time the page is requested by a user, client or browser. Template Module Caching allows for portions of your site to be rendered and then cached in the database to prevent the system from having to reprocess the same template code that would otherwise output the same content needlessly.